With fall knitting season bringing thoughts of pumpkins and mittens to the minds of knitters everywhere, I thought I’d play around with yarn possibilities for two of my favourite patterns. Imagine the Thotful Spot set (Hat & Hand Warmers) in the sophisticated autumnal wine colour of Shrewd Lady Mary. Or the ‘purply grey is the new black’ option of Hinkypunk. 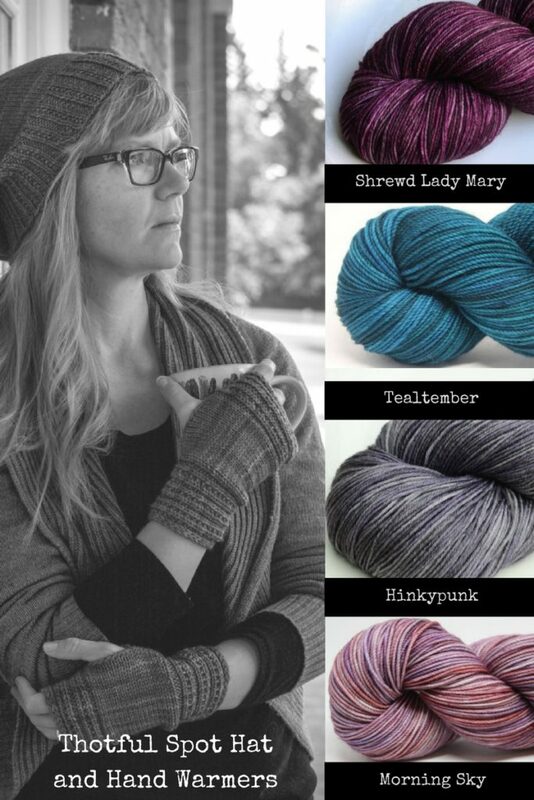 Both are available on the Lavish DK base from One Twisted Tree. Then there are the sky options: the soft, warm, welcoming sunrise colours of Morning Sky; or the bright, dazzling blue of an autumn noon captured in Tealtember. Both come on the Rendezvous Sport Sock base from Unwind Yarn Company.